The APC community–students, parents, teachers, community leaders–together with APC Executive Director Pedro Walpole celebrate the closing of School Year 2016-2017. Peace be with you and great joy this day. We are again, coming together to celebrate and share our joy for the 24 graduates and for all students who will come later onto the stage to give thanks and happy smiles to their teachers – kay ate and kuya and most of all to their parents. This occasion is a moment when the dreams of Apu Palaguwan for his children will become a reality. This reality is our choice to be educated, to learn in a way that our potentials, skills and values will be knitted together every day so a better future for these graduates is within their reach. 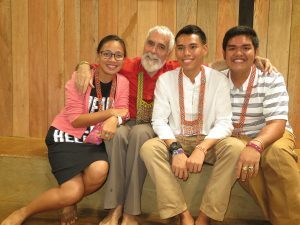 All of these become possible because this Pulangiyen community really takes care of one another–we talk with everyone, we sit apart and listen carefully, we work together, we understand our failures and the challenges ahead of us. Today, it is very evident that despite the waves of challenges that we’ve been through for the whole year, this small sitio and all of Upper Pulangi can joyfully present 24 graduates who finished their sixth year level in grade school and 57 in secondary level, all ready to move up on the next academic year. This is a promising number of children and youth coming from different villages trying to learn different branches of science, culture and a way of living with perseverance and commitment to sustain these efforts in school. 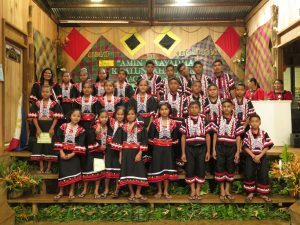 Twenty-four Grade 6 students graduated from the Apu Palamguwan Cultural Education Center in March 2017. To the graduates, your decision to be in school and to continue on to the next school year is the best thing that you could offer now for your present life and your future. Do not stop from learning and discovering new thing and from beginning new ideas. Don’t be afraid to experience mistakes, and instead always find the balance of life in order to understand the wisdom of relationship of living Creation. Do not stop from building your own communities. To the parents, never forget that home is the first source of knowledge of your children, and you are their first teachers– models of discipline and great source of support and strength. The community is always a venue for these children in the sharing of common values, aspiration, and courage in seeking alternatives that respond to social needs in a sustainable manner. Always remember that the core content of our curriculum is coming from our reality and way of living and it will be always designed in our context. APC is a community school, its vision and mission is always for an inclusive human development. which these youth advance and have courage. You are the blood vessels of the school; you are carrying the values to the hearts of our students and you perform a vital role in feeding their minds. Much of your daily life is in school. You shared a lot of moments with your colleagues or co-teachers compared with your husband, wife, or parents. May Anne Krissanta “Mayang” Caduyac, Jed Angelo Marcelo, and Jose Bonifacio “JB” Sibayan pose for a photo with APC Executive Director Pedro Walpole during the 2017 APC graduation. 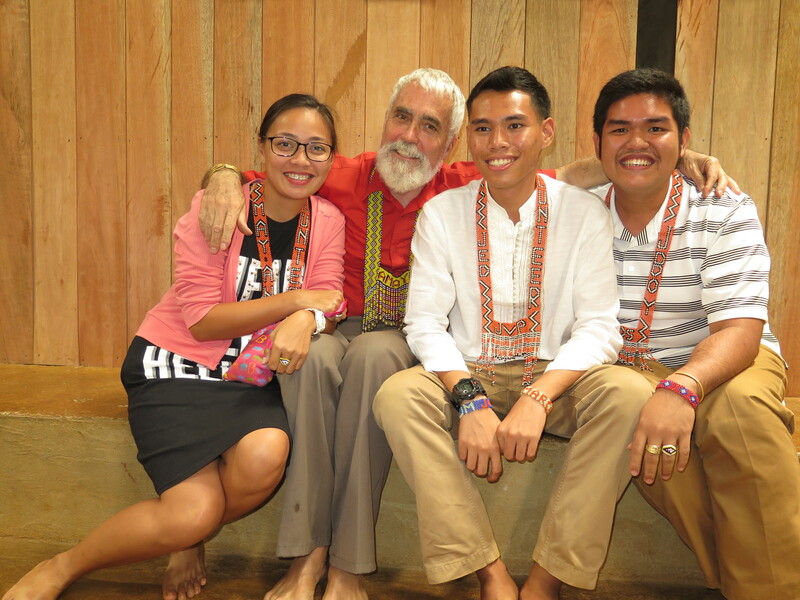 Mayang and JB were volunteers from Xavier University’s Peace-Year of Service (YOS) Program, while Jed was from Jesuit Volunteers Philippines (JVP). The daily life of teachers most of the time is misunderstood by the people around. They think that your profession is only inside the classroom, but it’s not. Teachers have no break during weekends, holidays, and summer. These children and youth will forever look up to you. Indeed it’s stressful, yet it’s also truly rewarding to see that this younger generation is growing up with a better sense of life. From the deepest part of my heart, I am very proud of you, all the APC teachers, and may my prayers for you be heard by our Almighty Father. 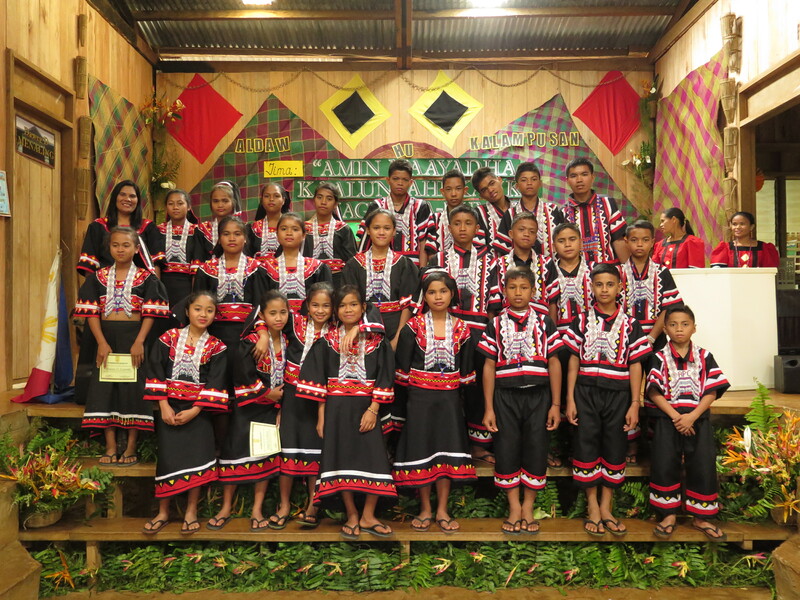 APC will continue to provide quality service for the sons and daughters of Apu Palamguwan, for the cultural communities, for the people, and will extend its programs to other cultural schools in Mindanao. Grade 10 will be opened in the coming months and hopefully we will have a good number of students and additional teachers. This coming summer, there will be a three-week summer course for all APC teachers and other partner cultural schools. Ateneo de Iloilo and other partners will come to help us in making this course helpful for the school. Hopefully, we can develop and open a program for the young adult students that would enable them to speed up in completing their secondary education. We are working now on our papers for TESDA accreditation of our Hulas technical course program. Building and Sustaining an Eco-Agri program with the youth is new program of the institution for the youth as a venue for learning on Organic Farming and is designed to support the need and demand for food for the students in all dalepaan. Developing training facilities for the school, community and long term goals of APC, Environmental Science for Social Change, and Bendum Tribal Council for Upper Pulangi. You can continue to learn because when it is a natural cultural process growing out of your own language and continuing to be open to the challenges of other languages and cultures in the years ahead. Learning from within your culture and going beyond allows you to become subjects of your future and not objects of another’s system of exploitation. Your primary objective as students in this community is to be leaders of service, to serve the common good wherever you meet it and sustain the environment wherever you live. Once you begin to exchange in other languages, that capacity does not stop when classses stop. It is a social skill and not an academic exercise. In this way your culture also gives you the opportunity to be uniquely yourself and grow in relation to others. Let us close this school year full of gratitude to our Creator for the gift of life, to Apu Palamguwan for the vision and to our God for making all of these things possible and memorable. To the graduates, I am really happy for you. Do not stop believing in yourself that you can do great things. To all the ate and kuya, all your contributions will be forever in my heart. To parents, community members and Tribal council and Datu Nestor Menaling – congratulations and let peace on earth prevail with the presence of God.